The big round tables are stocked with pads of paper and pens, Post-it notes and Sharpies. The agenda is printed, after the last finishing touches to the intended choreography of the event. Flip-chart stands are positioned around the room. The projector has been tested, our slide pack is ready to go. But it isn’t time to start a Knowinnovation meeting until the toys are out on the table. In fact, putting your hands around something may actually help you get your head around it. Neurologist Frank Wilson, in his book The Hand: How Its Use Shapes the Brain, Language and Human Culture, believes that hands-on exploration is critical to cultivating inventiveness in children. He’s concerned that the current generation of students isn’t getting enough hands-on practice to develop the necessary problem-solving skills. Another case for keeping toys handy, according to Scientific American, is that toys can serve as inspiration. Benjamin Franklin used a kite for his experiments, The Etch-a-Sketch has served as a model for problem solving, Lego have been used by researchers to test theories and by R&D teams to build prototypes. If we can think of problem solving as playing with ideas, then why not use toys, the cornerstone of play, to stimulate our thinking? Our silly table toys have become, inadvertently, a metaphor for framing a problem, or a spark for a new idea. Know further: Tips to help tactile learners, and more on the different learning styles. Not sure which is your learning preference? Take this survey. 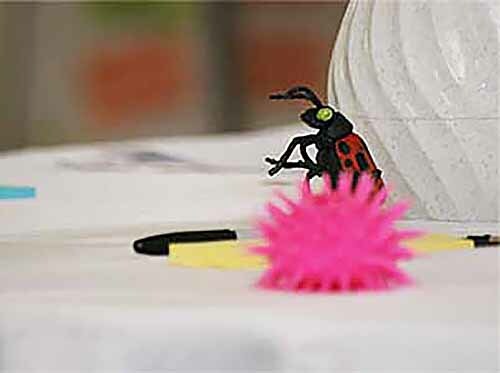 Order your own table-toys, also known as fiddles or stress-relief toys. Our favorite table toy, by the way, is the rubber chicken. And finally, further reading and viewing on the science of play.